Ladies! We are so damn excited about the impending Elisalex Dress sewalong! Only a week to go! 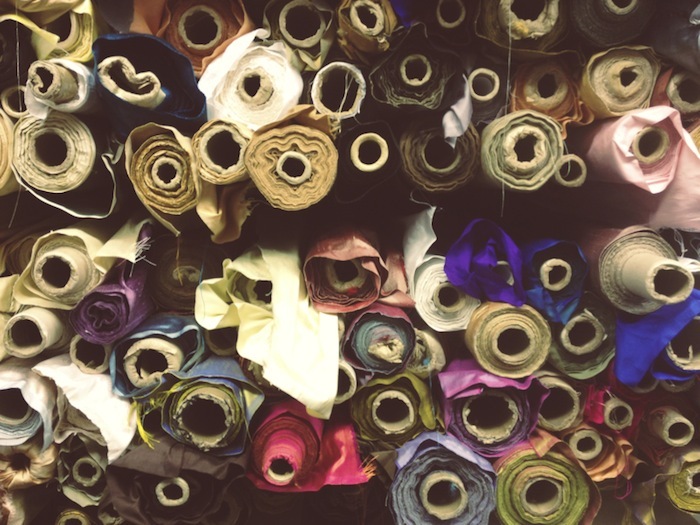 We wanted to take this opportunity to talk a little bit about fabrics and share some piccies we took on a recent shopping jaunt to London's Goldhawk Road. 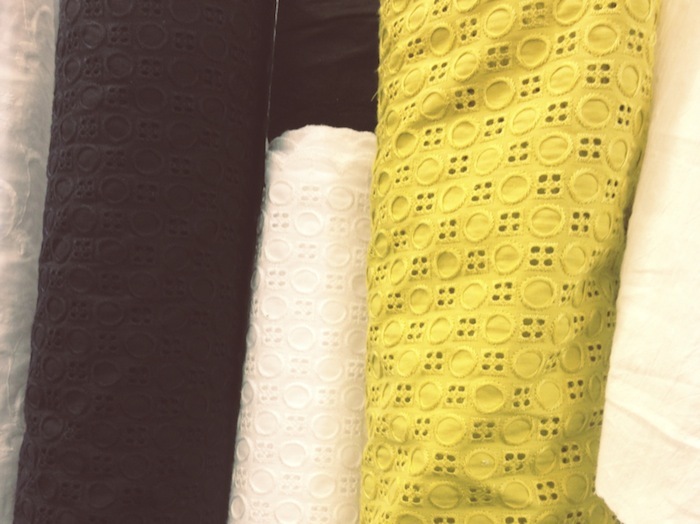 The type of fabric you choose for your Elisalex Dress will have a significant impact on the outcome of your dress. We have recommended medium-heavy weight fabrics on the pattern - why? - in order to showcase the exaggerated curves of the tulip skirt, you'll need a fairly stiff fabric to hold its shape. Anything too drapey will droop leaving you with a pretty sad and withered looking tulip! Upholstery cottons - it's a good idea to have little rummage around places like car boot sales, eBay or Etsy for vintage curtains - the fabric used to make curtains is perfect, and you can get some seriously great prints and cheap deals if you go second hand. The 1940s upholstery fabric we used for the original short sleeved Elisalex Dress was an eBay find, and we'll be using a vintage curtain snaffled from Mama's house for our main dress in the sewalong! 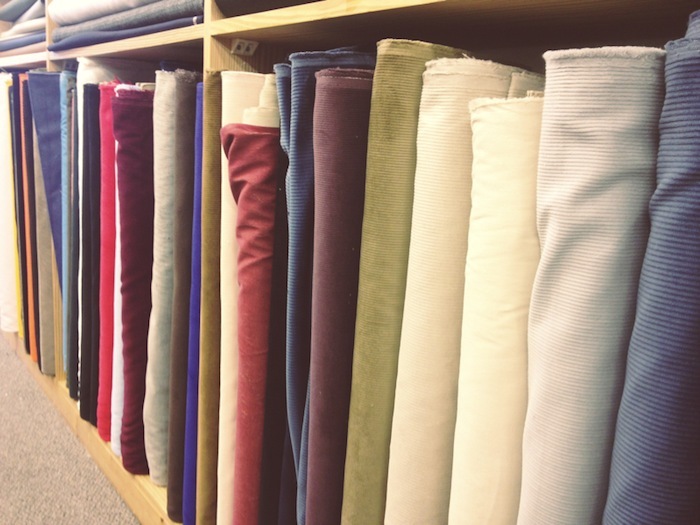 Ray Stitch in Islington also has a great range of upholstery fabrics. Broderie Anglaise - this is a pretty lacework fabric with heavily embroidered cut-out eyelet patterns. All the extra stitching gives this fabric quite a sturdy consistency. We found some great Broderie Anglaise at A-One in classic black and white, and this edgy shade of lime green... that's dedication to reviving the 90s right thrrr! Moving swiftly onto the good stuff: Silks. For a really spesh dress, it has to be silk, amiright?? 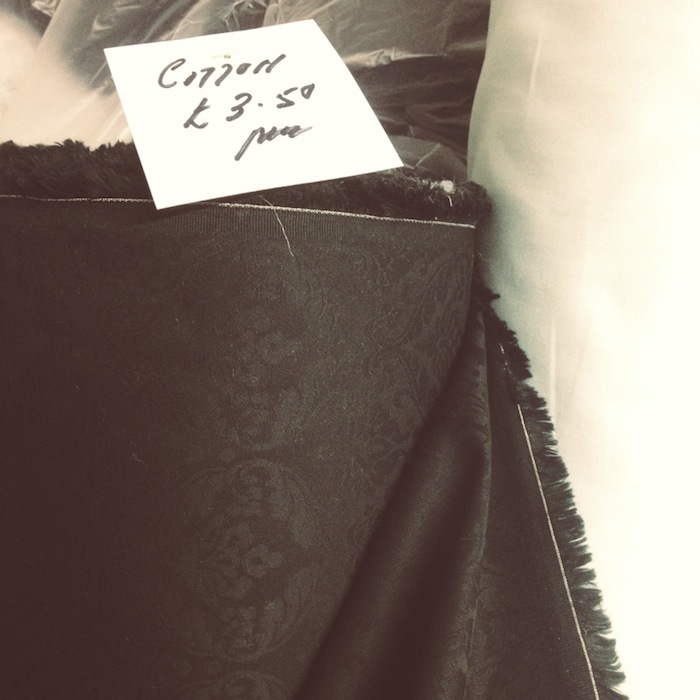 For our main sleeveless variation, we went for a classic black silk jacquard. Other not so obvious options include things like denim, leather (we dare you! ), velveteen (someone please make one in an Anna Maria Horner Loulouthi velveteen), corduroy and tweed. If, however, you've decided to mix it up and team the Elisalex bodice with an alternative skirt, the world of fabrics really is your oyster. As Heather Lou so beautifully put it, "The bodice may be my go to when I am frankensteining dresses in the future....". You could go for a circle skirt in a drapey crepe; a gathered skirt in a pretty printed quilting cotton like Sarah Grey's; or have you thought of trying out Elisalex & Charlotte's lovechild, the Elisalotte! Matching the Charlotte skirt to the Elisalex Dress bodice makes for the perfect wiggle dress; delicious in a soft and cosy brushed cotton or wool for those of you in the Southern Hemisphere thinking about your Autumn sewing plans... The possibilities are truly endless. Oh, and have you seen Rachel Pinheiro's jersey Elisalotte?? We'll be making up the main tulip variation as well as a half circle skirt variation in crepe, and a gathered skirt variation in cotton, so whatever you decide, we'll be there to guide you through! I’m so stoked that you mention corduroy is a suitable option! I bought some fabulous corduroy fabric today for a bargain price from the op-shop (second hand shop in Australia :) – animal print for the bodice and beautiful dark brown for the skirt. I’m late to the Elisalex-dress party but super excited to make up my first one !! Hey – I’m a little late to join the sew-a-long party, but I can’t stop thinking about this dress so I think I’m going to have to make it! I have a piece of stretch taffeta I might use – I think it would be suitable because it’s pretty stiff, but I thought I ask. Well now I absolutely HAVE to find vintage curatins for this dress, just so I can proclaim “I saw it in the window and couldn’t resist” a la Carol Burnett in her Went With the Wind episode!! Thanks for checking out the fabric for me – that kind of personal service is just one reason why indie’s are the best! Roll on the 11th! I’m going to Mood in a few weeks to get fabric for this dress and I’m so excited!!!! Thanks so much for this really useful guide! I’m planning my Elisalex fabric shopping for Saturday so I’ll be writing some notes from this to guide me. I was thinking of a Liberty cotton twill I’d seen on the Shaukat website but am going to rethink this in the light of your advice.